This week begins a run of performances of Verdi’s The Force of Destiny at English National Opera. I am singing in the extra chorus. 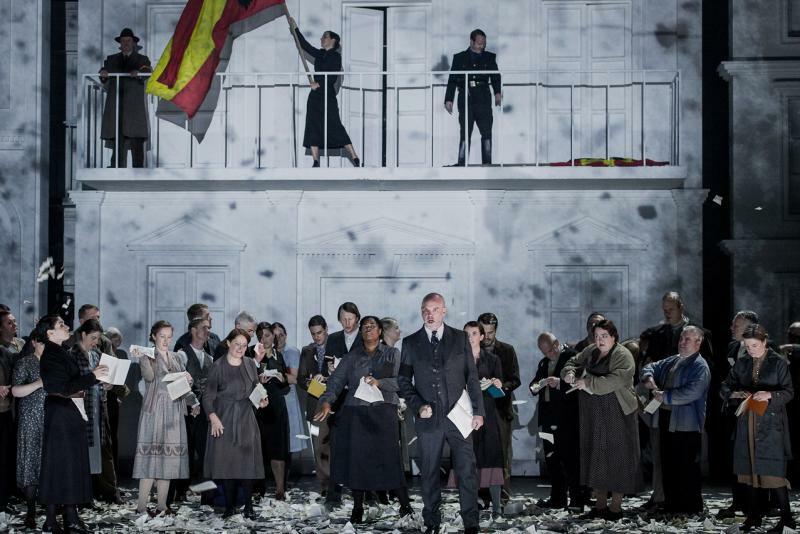 There are a lot of us: Calixto Bieito’s production casts the belligerent masses as nationalists at the inception of the Spanish civil war. This powerful, sprawling opera will run until the beginning of December before it goes across to the Metropolitan Opera House, as it is a co-production. This entry was posted in Uncategorized on November 7, 2015 by CheyneyK. This month I am involved in the opening production of ENO’s 2015-16 season, Shostakovich’s Lady Macbeth of the Mtsensk District. Dimitri Tcherniakov’s updated conceit has Shostakovich’s modernist fairy-mare set in a health and safety-compliant warehouse. We in the chorus populate the space as worker ants, be it at the beck and call of the state or some private entrepreneur. Shostakovich’s conundrum is that disaster befalls the individual trying to follow their own impulse, whatever its moral equivalence. The company orchestra are on their greatest form to date with the new Musical Director Mark Wigglesworth. And I get to ride a fork lift truck. This entry was posted in Uncategorized on October 17, 2015 by CheyneyK. I’m really looking forward to singing in the first performance of an updated La Boheme this week. Opera 24 and Darker Purpose Arts are bringing Puccini’s opera to the Grimeborn opera festival (at the Arcola Theatre in Dalston, Hackney) from Tuesday. Lewis Reynolds’ production uses a translation from John Farndon which places the drama – and its vernacular – in contemporary Dalston. I am singing the role of Colline, the bearded ‘philosopher’, a character for whom the markets of Hackney provide plenty of opportunity to find a coat and satisfy his love of books (and a kebab!). The rehearsal process has been organic and collaborative. Together we’ve pursued the fun of the story of young people living and loving in the city; we’ve also tried to find the authenticity of the relationships and dramas in this contemporary situation, dusting off the quicksilver observation of Puccini’s score and punching new life into the music. Nick Fletcher conducts a specially reduced arrangement of the score that is at once expedient for the Arcola but nonetheless sustains the richesse, tenderness and power of this much-loved opera. This is by no means, except by irony of its setting, a hackneyed production of La Boheme. UPDATE (25/08/15): The production and performance was generally well-received and we were pleased to get a brief, four-star write-up in the Observer. This entry was posted in Opera on July 27, 2015 by CheyneyK. It’s a grey, wet day in this final week of July here in London. This is nothing more than the capricious English weather toying with us during the Summer of course. Yet it might be said to reflect the sentiment of a group of musicians about to meet at St. Mary-at-hill church in the City of London. That’s because this evening threatens to be the final in a series of Bach cantata performances within the liturgy of Lutheran Vespers that has been ongoing since the 1980s. Martin Knizia, the current director of the group (the Sweelinck Ensemble) who also holds the position of cantor of St. Anne’s Lutheran church in London is leaving to take up a position in Berlin. Martin has been the administrative and artistic force behind the series of so-called Bach Vespers, as his predecessor Peter Lea-Cox was before him, so his stepping down brings the series (under the umbrella of Music-at-hill, formerly the St. Anne’s Music Society) to a practical halt. I’ve had the good fortune to have been invited to sing with Martin’s Sweelinck Ensemble more often than not over the past 10 years. Our work has included performances of the St. John Passion and the B Minor Mass, as well as memorable outings of the prima inter pares of Bach solo cantatas, BWV 82, Ich habe genug: one meant walking to St. Anne & St. Agnes, Gresham Street to perform through heavy overnight snow; more recently, we performed the cantata in order to raise funds to try and keep the series going in the face of increased costs and dwindling support in November last year. In addition Martin has unearthed all manner of fine music by Bach and his contemporaries, which we have performed at appropriate moments in the series. Of course, the miserable weather might well be said to resonate with the cantata we are about to perform in valediction of Martin. BWV 131, Aus der Tiefen rufe ich, Herr, zu dir is particularly morose even by Lutheran standards of self-abasement. The inexorable trudge of the Bass arioso wonders whether they’ll be anyone left after God has decided who’s worth saving. BWV 131 and other music by Bach, Buxtehude and Schütz is performed within the Lutheran service of Vespers this evening at 6.30pm. Entrance is free and there is a retiring collection. This entry was posted in Uncategorized on July 26, 2015 by CheyneyK. Edward Gardner’s final production as conductor of English National Opera, Tchaikovsky’s Queen Of Spades, has now opened at the Coliseum in London. Reviews have been positive, not least for the music, with most critics pointing towards the contribution of the chorus (prepared by Stephen Harris). 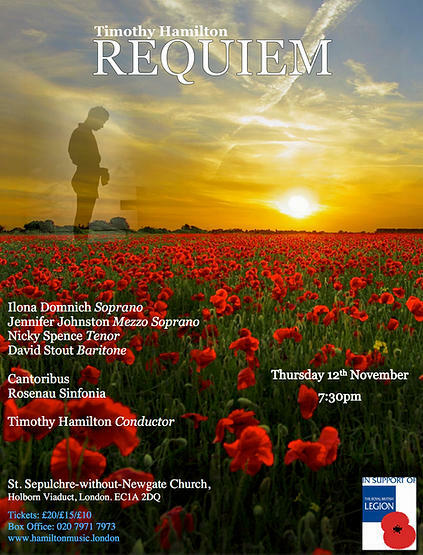 I am singing as an extra chorister in this production by David Alden, my second with the company this season. My role in this expressionist production involves all manner of characters and costumes – including a big furry mouse’s head. Above all, it has been a tremendous privilege to watch and hear the highly-respected mezzo-soprano Dame Felicity Palmer at work. The production runs throughout June. This entry was posted in Opera on June 8, 2015 by CheyneyK.